It's so cute! Victor's mini shuttlecock is made with real feather and cork, just like a real shuttlecock. The mini shuttlecock is attached to a suction cup. Each is encased in a clear case. Goose feather shuttlecock that is good for regular play. Best Seller! On of the most popular shuttlecock from Victor. Inexpensive with very good flight pattern. Best Seller! 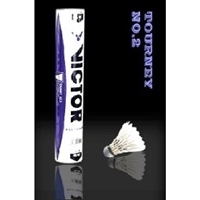 One of the most popular shuttlecock from Victor of all time. An inexpensive shuttlecock that is good for regular play. A very consistent shuttlecock and also very durable. Great flight and shuttlecock response. The best shuttlecock from Victor. Offers exceptional flight pattern, durability, and consistency. 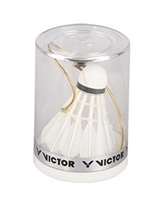 Aerosensa 50 is BWF approved for International Tournament.